Just back from a great DisplayWeek in Vancouver. Finally had a chance to recover, go through my notes and process everything I saw at the show. Most of the big story lines will be pretty familiar to anyone who followed last years show: TV’s are still getting bigger, OLED TV is still right around the corner, 4K is starting to ship and mobile displays are getting both sharper and more efficient. DisplayWeek wasn’t all old news though. In fact, just like CES, this year everyone seemed to be talking about color performance. At the annual Display Industry Awards, honors in several categories went to wide gamut display technologies including the Best In Show and Component of the Year awards. And, on the show floor, major manufacturers like 3M, Samsung and LG dedicated significant booth space to wide color gamut or color management technologies. 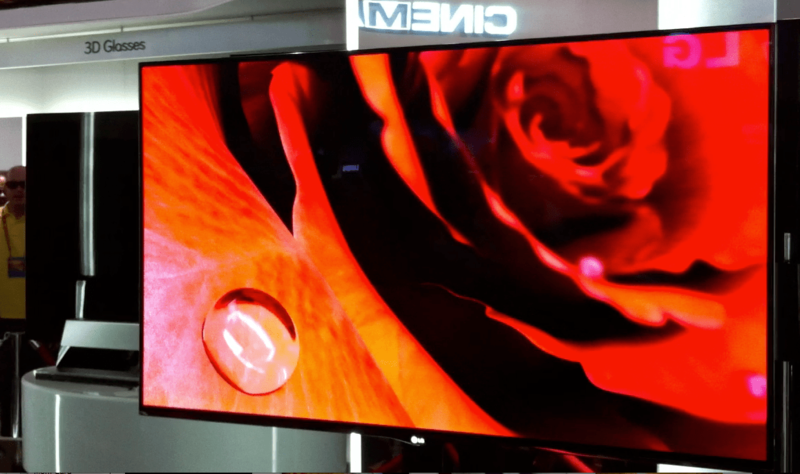 3M’s Quantum Dot Enhancement Film (QDEF) demo at DisplayWeek 2013. Bottom display is using quantum dots to achieve a wider color gamut than OLED at higher brightness and lower cost. 3M demoed several wide color gamut LCDs based on the Quantum Dot Enhancement Film (QDEF) technology that they are partnering with Nanosys to manufacture. Ranging from smartphone all the way up to 55″ TVs in size, these devices were all showing a wider color gamut than OLED with an especially deep red. This seems like a lot of color but 3M says that in developing their Perceptual Quality Metric (PQM), a new analysis tool aimed at helping display makers model how different performance characteristics will affect end user experience, they found that color saturation positively affected the perception of quality. In Samsung’s neighboring booth, I found a series of comparison demos designed to show that wide color gamut displays can be both accurate and pleasing to the eye. Each demo featured a camera feeding a live image of several colored objects to both standard and wide color gamut displays. In each case the wide gamut display was able to more accurately recreate the color of the objects in front of the camera. They also showed off the new color management capability of their flagship Galaxy S4 smartphone that allows the device to accurately display rec.709 content without oversaturation- something the previous generation S3 struggled with. Finally, at LG’s booth, we saw a new LCD color filter design that allows them to cover the Adobe RGB color gamut used by photographers and print professionals. With all of this buzz, it looks like we’ll start to see wide color gamut displays start to move into the mainstream in ever larger screen sizes over the next half of this year and into 2014. If there is one thing we can take away from CES this year, it’s that displays with better color performance are on the horizon. Two of the largest attention getters at CES this year were new displays by Sony and LG. LG unveiled a 55″ OLED and Sony displayed a new “Crystal LED” technology. While both of these displays exhibited impressive performance, including a wider color gamut, the Sony TV was a prototype only, and the LG display is expected to be available later in the year at a hefty price. As Hubert of Ubergizmo points out, these technologies offer great promise, however, cost will be their determining factor. OLED, which has been on the horizon for what seems like forever, still looks like it will not be available to the masses for quite a while, certainly not in large formats and not at a manageable price point for the consumer. By contrast, QDEF, offers an affordable, consumer ready solution today. Display designers who are looking for the next new thing will find that they can have a screen with high brightness, deep color, high-DPI resolution and deep blacks in a display that’s as big as they want using QDEF with no increase in cost. This is because QDEF has been designed as a drop-in diffuser sheet replacement to leverage the billions of dollars of existing installed manufacturing capacity and two-plus decades of improvements to LCD performance. With QDEF, manufacturers can easily replace the diffuser sheet in their displays with a sheet of QDEF and gain over 100% of NTSC color performance.